This week take advantage of our 2018 Presidents Day Deals and receive a Visa Prepaid Cards by Mail on tires and wheels! Car: '17 Outback Limited 3.6R in Venetian Red. Hey Matt, check your mailbox! I want to get my wheels and tires ordered. Do you have a direct #? I tried calling DT direct but the wait was insane, and I wasn't sure if I'd get you. Yes - our apologies for the extended wait times! Looking at your PM next. I'm looking for Method 502's with 235/65/17 in an A/T tire (I'm open to suggestions). My car is not lifted and I don't want any rub. Whatcha think? Looks like an excellent fitment from this end! In the market for tires and/or wheels? 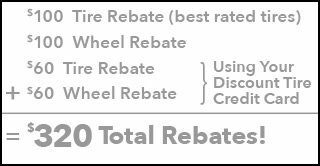 Then now's the time to take advantage of the fantastic savings during this huge Presidents Day Deals Event at Discount Tire Direct! Find what fits your vehicle by following the link below; feel free to shoot us a PM as well, we're happy to help! Sorry I didn't reply to you PM. I don't have enough posts yet. I went down to my local DT and ordered the 502's! Thanks for reaching out. Today is the last day to take advantage of Discount Tire Direct's 2018 Presidents Day Deals!